If you’ve read my blog at all in the last month, you know how much I love the Lady Sherlock series by Sherry Thomas. The Hollow of Fear is the third book in the series and recently was published. I am so glad to be back in Charlotte Holmes’ world. The Hollow of Fear picks up a few months after the end of A Conspiracy in Belgravia. Lord Ingram’s wife, Lady Ingram, has fled because she is being hunted by the Crown because of her relationship with Moriarty. Charlotte and Mrs. Watson retire to the country, and Livia goes to stay with a relative. Everyone is nearby Lord Ingram’s country estate, Stern Hollow, and when Lady Ingram shows up dead in the icehouse on the estate, Charlotte arrives to assist Lord Ingram with the police, but as Sherrinford Holmes, Sherlock’s eccentric brother. But will Charlotte be able to figure out what actually happened to Lady Ingram before it’s too late? The Hollow of Fear spends a lot of time from Inspector Treadles’ perspective, and while he bothered me big time in A Conspiracy in Belgravia, he somewhat redeemed himself in this book, thanks to a delightful come-to-Jesus moment from Charlotte. And he begins to see how women are really treated differently, but are strong nonetheless. This is why I love this series so much; even though women at the time, especially society women, had no expectations other than to get married, Charlotte and friends are all extremely capable, independent women who do not need a man. The series has such a “down with a patriarchy” feel to it, but also reveres the good feminist men, like sweet, lovely Lord Ingram. Lord Ingram and Charlotte have had a strange relationship throughout the series, but finally, they get to act on their feelings. Lord Ingram is a romantic at heart, even though he comes across as a stodgy Brit. Charlotte, on the other hand, is unapologetically pragmatic and does not understand marriage and making a long-term commitment to one person. Yet the two of them care so much for and understand each other. I absolutely love their storyline, and I cannot wait for the next book in the series. Also, we got to see a lot of Livia in The Hollow of Fear. In the previous two books, she has been very timid and a worrier, and while she is still those things, her character arc has been the most interesting to watch. She stands up to society ladies and gets sassy to the police; it is amazing. You do you, Livia. The end of the book was a bit of a cliff-hanger for Livia; I cannot wait to see what Sherry Thomas has in store for us. I’ve said this before, but I will keep repeating myself: everyone should read this series. It has a little bit of everything. 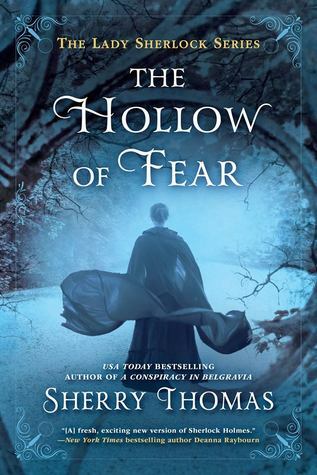 I adored The Hollow of Fear and give it 4.5 stars. What other historical fiction novels do you recommend with a strong female protagonist?